Easily my favorite collection of stories in the Archives series, this volume offers the finest color reproduction of tales that warrant the format. The edition begins with the 1988 mini-series by J.M. DeMatteis and Mark Badger, whose reinterpretation of the character has defined his representation across all media ever since, as well as a follow-up from an annual. Next comes the Secret Origins story by Mark Verheiden and Ken Steacy that strongly influenced Cooke's J'Onn J'Onzz in New Frontier. Finally, the complete American Secrets prestige minki-series, gathered in one English language volume, and possibly the greatest Martian Manhunter story ever told. 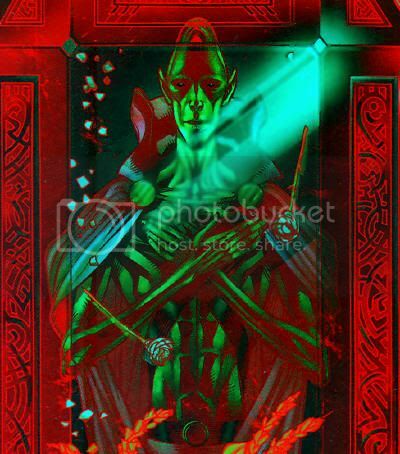 The Human Flame is conceptually and ideologically opposed to the Martian Manhunter. J’Onn J’Onzz is a humble, introspective, benevolent immigrant perpetually in mourning for his beloved wife and daughter. Mike Miller is an entitled, obnoxious, malevolent native who ignores his ex-wife and child when not outright abusing them. J’Onn J’Onzz prefers to use his vast expanse of power sparingly, working through proper channels as part of a cooperative. Mike Miller rubs whatever abilities he has in the faces of any in his path, regardless of casualty or consequence, and will stab any back presented to him. J’Onn J’Onzz is among the most beloved and respected super-heroes in the world, even among super-villains. Mike Miller is loathed and dismissed by virtually everyone, good or bad, and hasn’t a friend on the face of the Earth. Even visually, Martian Manhunter’s smooth bare skin is contrasted against the Human Flame’s being nearly enveloped in his safety gear, only his furry Cro-Magnon mouth visible. They share alliterative, homogenic English names, but this only illustrates how one is a perversion of the other. The Human Flame was created to battle the Martian Manhunter. In the old Detective Comics stories, J’onn J’onzz’s existence wasn’t publically known, and few crooks went out of their way to confront police detective John Jones. Even after the Martian Manhunter went active with the Justice League, he mostly stumbled upon plots in motion independent of his influence. Mike Miller was just your average thug, but when he decided to build a crime suit to hit the big time, he specifically had Martian Manhunter in mind as an obstacle to overcome. Aware of rumors that the Alien Atlas was vulnerable to fire, he built in flame projectors and named himself after that ability, even though the suit’s primary weapon involved electricity. While lots of foes have been created for Martian Manhunter books over the years, few if any owe their canonical existence to J’onn J’onzz himself. 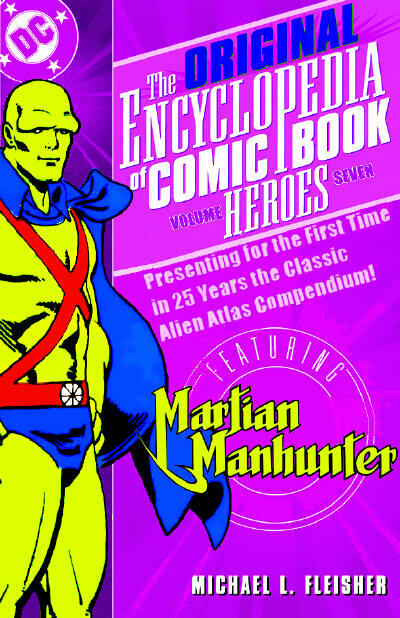 The Human Flame was the first super-villain to openly battle the Martian Manhunter. Simply put, the existence of Martians on Earth, and the presence of a clandestine guardian among them, had just been revealed (not to mention their vulnerability to fire.) Now that Martian Manhunter was a proper super-hero, his first proper super-villain was the Human Flame. During DC vs. Marvel, Martian Manhunter was placed against the Human Torch in an off-panel tussle. Even though at that point his flame vulnerability was purely psychosomatic and largely set aside, many assumed Johnny Storm to be the obvious victor. However, the Human Torch could never sustain a solo series, and cannot compete with the popularity of every other member of the Fantastic Four, so he is often the jobber of the team. Asbestos, water, the absence of oxygen—the Human Torch is always taking a powder. While the Human Flame is no Human Torch, his entire introductory story revolved around Martian Manhunter circumventing fire without Mike Miller even knowing what the Martian Marvel was up to. All of this is meant to show that while J’Onn J’Onzz is vulnerable to flames, it’s a challenge, not a silver bullet. The Human Flame is the first classic Martian Manhunter villain anyone bothered to remember. J’onn J’onzz never had that great of a rogues gallery, but each decade has offered a decent selection of bad guys worth revisiting. However, I can’t recall a single one pre-dating the mid-80s to make a return appearance against the Alien Atlas, except Mike Miller. The Human Flame had his own mini-series.. While it’s more common today, super-villains who have enjoyed their own title are afforded a certain cache at DC Comics. Darkseid has never been more than an ensemble favorite, Gorillas Grodd has only been part of starring teams, and Vandal Savage headlined a four part arc in an anthology, but only Mike Miller got his own six issue mini-series. The Human Flame helped “kill” Martian Manhunter. Effigy, a Green Lantern Kyler Rayner foe, and Dr. Light, a general DC villain specializing in the Teen Titans, actually captured and held the Martian Manhunter. 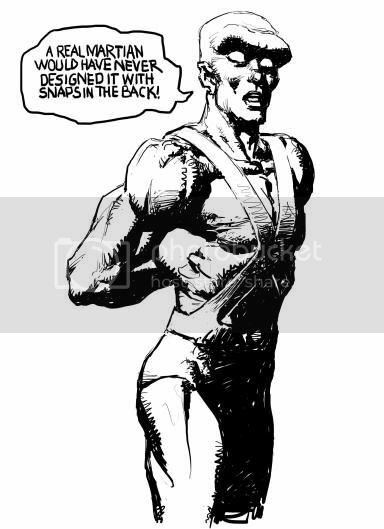 Libra, a ‘70s Satellite era JLofA baddie who orchestrated the conspiracy to murder J’Onn J’Onzz, was the one who drove that flaming spear into his chest. Mike Miller, who had one super-heroic “archenemy,” was asked which one he wanted dead, and snapped cell phone pictures when his wish was granted. 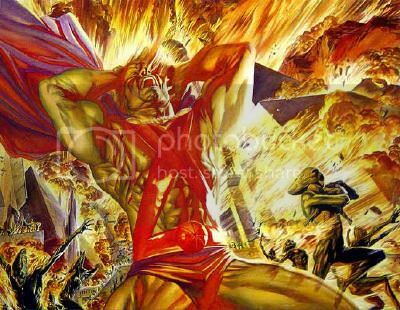 Regardless, the Human Flame was the Martian Manhunter villain present who targeted J’Onn, so he gets the undue credit. The Human Flame is the best known Martian Manhunter villain. Thanks to his visibility in the Final Crisis event, the Human Flame is more widely known than any other villain created specifically to battle the Alien Atlas. There are more famous foes of J’Onn J’Onzz, but they all originated in titles not starring Martian Manhunter, and are often more associated with other heroes or thought of as general DC Universe bad guys. No matter whom the Human Flame actually fights, and he’s had more run-ins with other heroes than he has had with Martian Manhunter, he’s still thought of as belonging to the Sleuth from Outer Space. When you ask the average comic reader to name a Martian Manhunter villain, unless they’re a diehard fan, the Human Flame will likely be one of the first names out of their mouth. The Human Flame is the model for the unworthy villain elevation. In much the same way the Martian Manhunter is a patron saint to loser super-heroes, the Human Flame proves that any douchey, obscure, irrelevant nobody of a villain can come out of nowhere to get his own book and pivotal role in an event. The Human Flame f’n blows. Seriously, he’s a waste of flesh, blood and hair. He makes our hero look bad by association, on account of the blowing. He has yet to develop a strong visual. The Human Flame suit is interchangeable with a dozen other arson-based crooks, his cybernetic upgrade was a ‘90s flashback, and the Inhuman Flame is the type of generic molten monster that was omnipresent in the Silver Age. When you’re defined by unfortunate facial hair, serious thought needs to go into your rehabilitation. He’s so derivative, he’s practically a mash-up. Inventor. Flame powers. Unmotivated hostility. Greedy. You could build the Human Flame out of random diced throws with a role-playing character generator. He’s the worst Silver Age Martian Manhunter super-villain. Tell me you wouldn’t rather read about Mr. Moth or the Human Squirrel. Archetypal super-heroes like Captain Marvel and Superman are like George W. Bush—plain spoken, outwardly virtuous, and direct in action. That makes Dr. Sivana and Lex Luthor members of the liberal academic elite in their pursuit of abhorrent social change and detachment from the common man. Martian Manhunter flips this dynamic, as he’s a dark-skinned alien scientist/philosopher who achieves his goals not through force, though he has abundant access to such, but instead through diplomacy and almost inscrutably circuitous avenues. The Human Flame then is a devoutly blue collar tea bagger high-fiving the guys at the NRA booth who drew a Hitler mustache on Barack Obama. Mike Miller built a crime suit to enable simple smash and grab tactics while warding off the local constabulary and super-hero with the seemingly foolproof means of fire and electrical projection. If Batman is the hero any of us could be with enough training and discipline, the Human Flame is the super-villain waiting for any of us in the garage after a trip through Radio Shack and Home Depot. The Human Flame started out as a regular enough Joe as far as crooks ago, but then this un-American super-creep came into power. It sent Mike Miller on a mission to take Martian Manhunter down through whatever sordid means or questionable alliance was required, and damn any who stand in his way as a cowardly traitor! This of course leaves Miller wide open to manipulation and demonization by forces far beyond his comprehension, but it also allows him access to power unattainable through the standard channels that keep him struggling. Besides, it isn’t murder if it’s a Martian, right? The Human Flame is also a walking metacommentary criticizing J’Onn J’Onzz. Both characters debuted in Detective Comics, never really broke through, disappeared for many years, and returned in a big way with the expectation that they would impress fans. Yet, Mike Miller is a rather shoddy, low rent adversary, casting a jaundiced light on the Martian Manhunter’s checkered history and dubious rogues gallery. If the Human Flame is the great white hope, what kind of sap must the Sleuth from Outer Space be? The Human Flame is to the Martian Manhunter as Flag Smasher is to Captain America. So there’s this big bad that’s been built up for months as the kind of guy who can totally take out our hero. He’s like a negative image—a hostile nomad versus a patriot, a terrorist versus a defender, the spearhead of a dangerous organization versus a lone protagonist; mace against shield. Then the guy shows up, gets dropped like a punk, and never does anything of note again. Yet, when you bring up a list of the hero’s rogues, there the little turd is, all promise and no performance. The Human Flame is to the Martian Manhunter as Doctor Octopus is to Spider-Man. Doc Ock was an early Spidey foe with powers tailored to match the hero, but he was also tubby in a hideously dumpy costume with a bowl haircut and thick glasses. 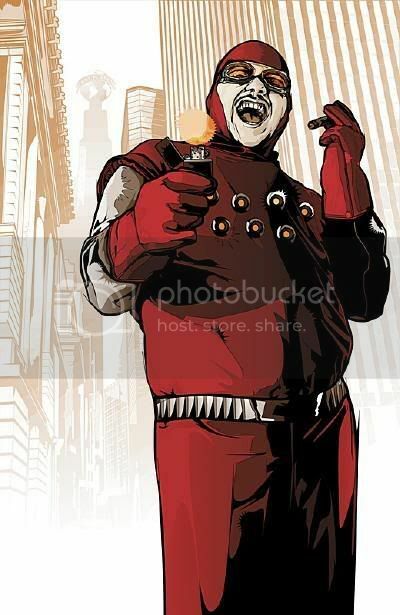 The Human Flame wasn’t quite as portly in his first appearance, but the years were not kind to his waistline, and he also had an ugly suit with goggles and a moustache. In both cases, great effort has been expended in modern times to make these gadget/gimmick based villains cool, but no amount of trench coats and cybernetic implants can cover up the silly. Neither of these guys are Jerry O’Connell, the fat kid turned hottie, but are instead at best Corey Feldman, the shorter, dorkier Corey that loved Michael Jackson too much and Nicole Eggert too little. The Human Flame is to the Martian Manhunter as Javelin is to Green Lantern as Captain Boomerang is to the Flash. Green Lantern has a power ring that can create energy constructs of virtually anything he can imagine. Javelin wears a yellow outfit, and throws yellow sticks that sometimes spray yellow paint, taking advantage of an impurity in the ring. The Flash can move at supersonic speed and create tornados by rotating his arms. Captain Boomerang can throw tricked out children’s toys accurately. In both cases, you’ve got woefully outgunned antagonists getting by on personality, outrageous luck, and dirty tricks. Fernus the Burning Martian: Fernus wasn’t about confronting J’Onn J’Onzz with his weakness, but about an evil Martian battling the JLA without any weakness, plus winnowing the number of White Martians lying around and giving Plastic Man a spotlight moment. 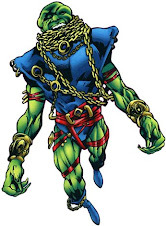 The Pyre: The post child for villains made up specifically to fight the Martian Manhunter, the Pyre is something that burns, is fated to battle J’Onn J’Onzz in some future time, and has yet to make more than a cameo appearance over a decade after its creation. Lobo: Even in his earliest appearance, but especially during Run!, the Human Flame was a barely directed berserker causing nothing but misery in his foul-mouthed and generally offensive wake. Lobo plays off Martian Manhunter well, but not often enough to qualify. The Human Flame is no one to crow about, but he’s relatively well known in modern comics circles and has impacted the course of J’Onn J’Onzz’s life in noteworthy fashion. Everything flows from Superman, the god of super-heroes. I suppose that would make Batman a demigod, overseeing non-powered caped crusaders, darknight detectives and the like. I’m not sure that Wonder Woman qualifies as a goddess, since most super-heroines follow the mold set by the first two, but merchandisers would argue otherwise. From there, deification is almost certainly overstatement, and archetypal heroes become more like patron saints of increasingly narrow sub-divisions. Flash presides over speedsters, and Green Lantern arguable over energy projection and outer space. Depending on your denomination, Aquaman or Sub-Mariner may be the guardians of undersea agents. Spider-Man represents heroes with feet of clay, Captain America patriots, Hulk anger and physical strength. As happens with saints, every little thing is governed by somebody, like Ghost Rider being the bikers’ hero, or Punisher standing for vigilantes, and so forth. If anything, the Manhunter from Mars would be the patron saint of loser super-heroes. The basic premise of a police detective with secret alien powers isn’t bad, but the inept writing of Jack Miller and the pleasant journeyman art of Joe Certa served the material poorly. Further, the strip quickly lost focus, and jumped onto any fad that might bolster its status as a third rate back-up in a poor selling Batman title. Cops & robbers, pulp sci-fi, super-heroes, bug-eyed monsters, spies… nothing really worked out better than keeping the strip from cancellation. After thirteen years of scrimping by, The Manhunter from Mars strip finally kissed the dirt, followed by sixteen years of mostly terrible and diminishing guest-appearances. What saved Martian Manhunter from the dust bin of history was his association with the Justice League of America. The super-hero market had bottomed out at the end of the 1940s, but editor Julius Schwartz had begun a successful revival in 1955. One of his company’s most enduring properties was the Justice Society, which gathered many of the most popular heroes onto one team. The premise remained sound, and Schwartz already had his well received new Flash and Green Lantern to start the ball rolling. Robert Kanigher supplied Wonder Woman, but Mort Weisinger was doing just fine with his Superman books without cannibalizing his sales to benefit another title. Jack Schiff was similarly stingy with his desperately flagging Batman line, as he was afraid of diluting what brand quality he had to work with. 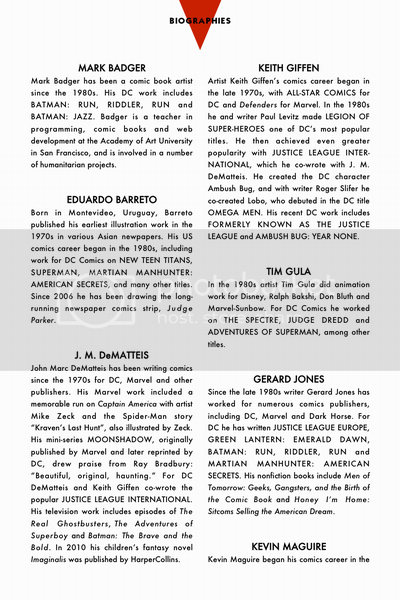 A team book didn’t seem the place to reintroduce more solo concepts, so the super-heroes who remained in publication to work with were Martian Manhunter, Green Arrow and Aquaman. Schwartz has stated that he’d forgotten about Ollie Queen (or perhaps didn’t want to wrestle with Weisinger any more than he had to.) Martian Manhunter was allowed to become a co-founder by default, where his role was to fill in for Superman as needed. A few years later, when the actual Superman became active with the team, and more viable heroes joined over time, Martian Manhunter was discarded. The Manhunter from Mars appeared sporadically until the mid-80s, usually in situations where he was begging for other heroes’ help, and sometimes getting into moronic fights with them first to appease the Marvel crowd. It wasn’t until JLofA writer Gerry Conway tired of having his headliners pulled out of the book by other editors that he started over with a new team of lesser lights that included J’onn J’onzz, still subbing for Superman. 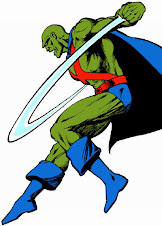 The Martian Manhunter was among the many heroes to become a toy in the Super Power Collection, and played token roles in merchandising tie-ins, but there was still no indication the character would ever rise above D-list status. J’Onn J’Onzz’s big break came with the Crisis on Infinite Earths, when his Superman-Lite powers offered him a seat with the powerhouses during the event. What’s more, the revised history following Crisis rejuvenated the Man of Steel by stripping away a lot of his canonical baggage, including membership in the Justice League. This left a gaping hole in continuity for someone to fill, and Martian Manhunter was already on hand. Further, the Alien Atlas was one of the few heroes not so tied-up in revisions as to be excluded from a new League, and when Batman bowed out, Martian Manhunter took on his role as grim taskmaster. Channeling the twin gods of super-heroes, is it any wonder the Sleuth from Outer Space was finally transitioning from zero to hero? Solo efforts for the Martian Manhunter were a bust, from his revised origin as a sort of R’brt N’vell, to his period detective dramas, to his short-lived sci-fi/horror ongoing. Still, so long as he remained in a highly visible leadership role in the JLA and as a single-bodied proxy for the World’s Finest, the Martian Marvel would command some small following. 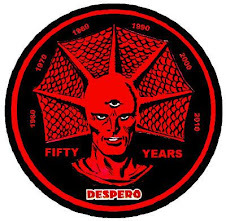 Despite never being able to pull his own weight, a poor rogues gallery, no supporting cast of interest, derivative powers and origins, a silly too common weakness, a lame costume and a great many more demerits, the Manhunter from Mars is still a power player in the DC Universe. Highly respected, he has even eclipsed heroes who alone easily outshone J’Onn J’Onzz in their day. Now you might think that Martian Manhunter has plenty of unique powers, and so many in total that he’s destined to become truly great someday. I would dispute this. A-type personalities don’t care about passive powers like telepathy, invisibility and intangibility. When played straight, these abilities would make J’Onn J’onzz unbeatable, but decades of comics have made it perfectly clear that he is entirely beatable. Besides the omnipresent and laughable aversion to fire, vulnerability is in J’Onzz’s character to the DNA. Realistically, humans like Batman, Black Canary and Green Arrow should all have died by now through their involvement with super teams. However, the Dark Knight is defined by being better than any super-human through his brains and skills, plus his moneymaking powers insure he will always play a pivotal role in stories that involve him. Green Arrow can be beaten, but part of his character is to be David to Goliath, the last hero standing with only arrows at his disposal, who still manages to save the day. Black Canary is the girl, and no one wants to see the girl picked on. Martian Manhunter though is insanely powerful while having only a small following and usually no presiding editor looking out for his interests. J’Onn J’Onzz is the hero who falls to make a villain look threatening and the heroes that will actually beat it look good. Even on lower tier teams, J’Onzz falls so a group effort can win the day. It isn’t Martian Manhunter’s place to be a winner. Beyond that, because Martian Manhunter is the “name” you get when better sellers aren’t available, part of his appeal comes from his relationships with inferior super-heroes. From the street incredulity of the Detroit-based League to the silly shenanigans of the International era through the footnote trainees of the Task Force, J’Onn J’Onzz is synonymous with the lost legions. When Martian Manhunter is treated as a force to be reckoned with, it’s in a book with also-rans at his side. As a result, when the Alien Atlas stands among the most magnificent of DC’s heroic pantheon, he represents those little guys who aren’t considered good enough. The founding members of the Magnificent Seven are only six strong, because when Martian Manhunter is there, he gladdens the hearts of Vixen fans, of Booster Gold devotees, of those who mourn Damage. J’Onn J’Onzz is the geek made good, reaching lofty heights through networking, minor historical relevance, and simply being in the right place at the right time. Through the patronage of the Alien Atlas, even the most weasely, ill-conceived lameazoid super-hero can hope one day to become the least among titans. 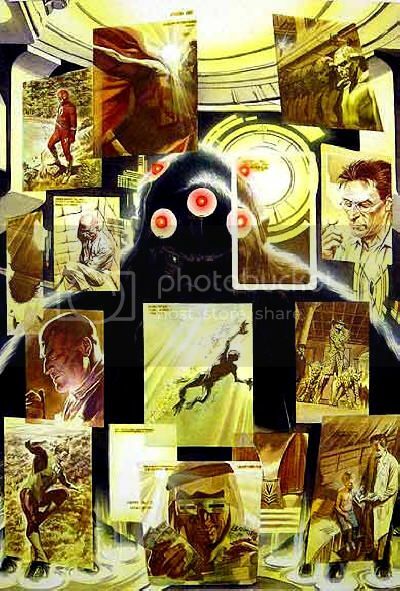 The latest J'onn J'onzz pin-up from Michael Netzer's Online Portal blog! 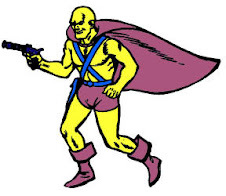 At the suggestion of Batman, Red Tornado had contacted the Manhunter from Mars in hopes of locating Aquaman under the sea. The League Satellite could turn up nothing, and J’Onn’s friend had been missing for weeks. “Martians, those of us who still live, are not defined in physical geometry like the people of Earth. The natural laws that govern Martian understanding are far larger and more encompassing than anyone can imagine. Our nature is adaptation, to this or any other world.” Through the sharing of other beings’ thoughts, and through the shifting of his shape, the Manhunter would plumb the depths for the king of Atlantis. I first got into the internet late last century, and have followed industry news fairly closely since the early '90s. Off the top of my head, this past San Diego Comic Convention was the least interesting in terms of "Big Two" news over that expanse of time. Maybe it's just the internet has killed the need for or thrill of a colossal summer announcement bomb. There wasn't much of anything regarding publishing plans that hasn't been known for a while, often directly from the company's sites. To my mind, the big news was the look at the upcoming Young Justice cartoon. I think it shows how desperately unhappy DC Entertainment was with Martian Manhunter's look that this is their second animated project in the One Year Later costume, which itself lasted little more than one year. I never minded the suit all that much, and his head is standard beetle-browed rather than Coneheadhunter, so no complaints from me. Curiously, Miss Martian also seems to wear a variation on that get-up in a few scenes. J'Onn seems present in a detached mentor role, which is still a greater presence than he's had in M'gann M'orzz's life since her creation four years ago. Still, the Usurper himself, Red Tornado, seems to be the veteran hero most associated with the team. That's one of the few holdovers from the series Young Justice got its name from, though Peter David will be writing some episodes. J'Onn remains with the Justice League, which appears to consist of the DC Trinity plus Grell Green Arrow and the hairy Aquaman that lasted for a few early issues of David's '90s run. In what little can be seen here, I already like Miss Martian better on the cartoon than in comics. I assume she won't be a crazy person there, and I like the emphasis on her telekinesis (a Martian power never mentioned but played up heavily in JLTF) and invisibility. I was afraid she would end up a green-skinned Supergirl, but this gives me hope for something much better. A freakin' love the animation style and character designs on display, which is tight and athletic without sacrificing the fluidity associated with DC 'toons. Also, Miss Martians has a promotional piece where she fights albino space monkeys over her "Sweet Sixteen" takes, which is a dream I wish I had. I understand John Jones has made some appearances in Madame Xanadu. Well, that's canceled, so I'll raid the cheapie bins a few months from now for the details. 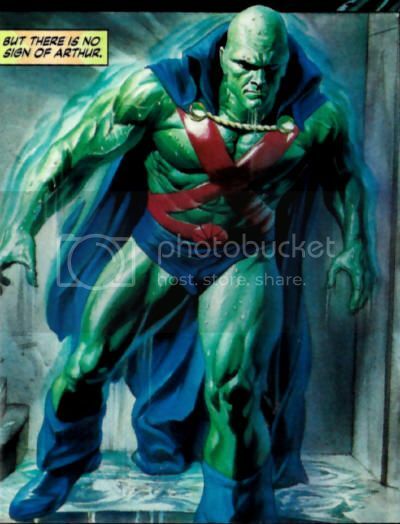 Self-sabotaging as usual, why not dilute the Martian Manhunter brand (such as it is) by bringing up those evil other guys in a Green Lantern: Rise of the Manhunters video game? Shortly before the con, DC offered a new cryptic teaser spread for Brightest Day, a practice that needed some time for the stink to die down from Countdown to Final Crisis. It's a fine arts swipe with super-heroes shoehorned in that offers no more relevant information than can be gleaned from solicitations. Martian Manhunter is shown trying to burn down the Star City forest, which tells us A) He doesn't like J.T. Krul's writing either; B) They're maybe trying to get rid of the fire weakness again, which never works; C) He hated The Rise of Arsenal like everyone else, and is hoping to stop Titans: Villains For Hire at the tree; D) It's good to wear pants near flickering embers; -A) Unrelated, but they totally figured the impression of Black Manta helmet on the ridge was too subtle, so they went all "red eyes in the shadows"; E) We're never going to get one of these things where J'Onn is just eating cookies with milk on a cloudless day. Arson, back-stabbing, but no Chocos with Lian and Ted. A while back, I responded to a list of The Most Iconic Martian Manhunter Covers, and then DC's 75th anniversary celebration began, so I offered J'Onn J'Onzz Variant Cover Suggestions. None of these things are a true "top cover countdown" for our favorite Martian, and I've been asked to compile just such a beast. Seeing as that's a fairly enormous task, I've decided to break up my lists by decade, starting with the 1950s. 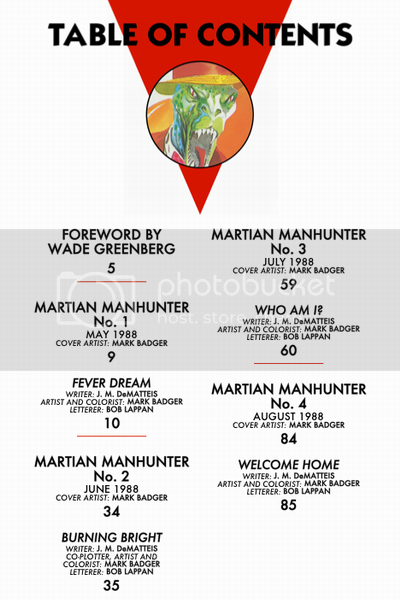 However, John Jones, The Manhunter from Mars wasn't featured on any covers for its first five years or so. How about I look at some oddball reprints of those tales, along with various and sundry, until the real countdowns roll out? Big Boy: Anthology reprints, originally heavily Western skewed, with a few ongoing characters. Co-Features include Tomahawk, Roy Raymond TV Detective, Bobo Detective Chimp, Silent Knight, Prof. Eureka and Green Arrow & Speedy. Big Boy #17 (February, 1958): Reprints "John Jones' Female Nemesis" from Detective Comics #246. Big Boy #19 (April 1958): Reprints "The Stymied Sleuth" from Detective Comics #250. Big Boy #20 (May 1958): Reprints "Target for a Day" from Detective Comics #249. Big Boy #21 (June 1958): Reprints "The Impossible Messages" from Detective Comics #247. Big Boy #22 (July 1958): Reprints "Alias Mr. Zero" from Detective Comics #251. Big Boy #23 (August, 1958): Reprints "The Menace of the Super Weapons" from Detective Comics #252. Big Boy #24 (September, 1958): Reprints "The Super Reporter!" from Detective Comics #253. Big Boy #25 (October, 1958): Reprints "The One-Man Army" from Detective Comics #254. Big Boy #26 (November, 1958): Reprints "The Carnival of Doom" from Detective Comics #256. Big Boy #27 (December, 1958): Reprints "King of the Underworld" from Detective Comics #257. Big Boy #28 (January, 1959): Reprints "World-Wide Manhunt" from Detective Comics #255. Big Boy #29 (February, 1959): Reprints "The Jinxed Ship" from Detective Comics #258. Big Boy #30 (March, 1959): Reprints "John Jones' Super Secret" from Detective Comics #260. Big Boy #31 (April, 1959): Reprints "The Getaway King" from Detective Comics #259. Big Boy #38 (November, 1959): Reprints "The Fantastic Human Falcon" from Detective Comics #265. Big Boy #40 (January, 1960): Reprints "The Crime Conjurer" from Detective Comics #263. Big Boy #45 (June 1960): Reprints "The Challenge of the Masked Avenger" from Detective Comics #266. The Hundred Plus Comic #50 (Circa 1960-1962): Reprints "The Impossible Inventions" from Detective Comics #279. 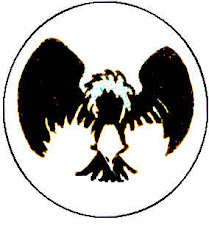 Rommets Helter: Specialized in Blackhawk, with minors in Atom, Batman & Robin. Rommets Helter #1 (1965): Reprints "The Case of the Golden Eagle" from Detective Comics #320. Rommets Helter #2 (1965): Reprints "The Hobby Missions" from Detective Comics #323. Rommets Helter #3 (1965): Reprints "The Man of 1,000 Disguises" from Detective Comics #315. Rommets Helter #4 (1965): Reprints "J'onn J'onzz vs. John Jones" from Detective Comics #314. 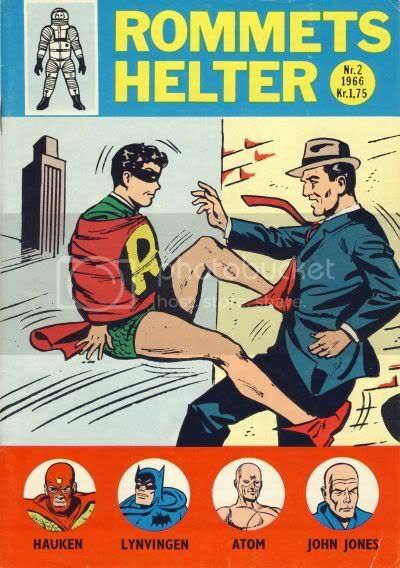 Rommets Helter #1 (1966): Reprints "The Man Who Saved Earth" from Detective Comics #314. John Jones was the cover featured star this issues, thanks to art derived from a repurposed splash page. Rommets Helter #2 (1966): Reprints "The Invaders from the Space Warp" from Detective Comics #311. Rommets Helter #3 (August, 1966): Reprints "The Bandits with Super-Powers" from Detective Comics #316. 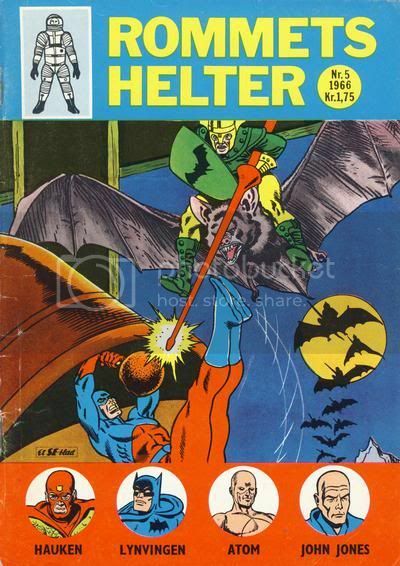 Rommets Helter #5 (December, 1966): John Jones had already been dropped from the book at this point, as part of a format change that left only Blackhawk and the Atom appearing. Läderlappen #7 (June, 1967): Reprints "J'onn J'onzz's Pesky Partner" from Detective Comics #312. Superman Presents World's Finest Comic Monthly #42 (Circa 1968): Reprints "The Case of the Magic Baseball" from Detective Comics #226. Superman und Batman #2 (Egmont Ehapa, 1969): Reprints "The Strange Experiment of Dr. Erdel" from Detective Comics #225. Superman und Batman #3 (Egmont Ehapa, 1969): Reprints "The Case of the Magic Baseball" from Detective Comics #226. Superman #19 (December, 1969): Reprints "John Jones' Farewell to Earth" from Detective Comics #267. Super Adventure Album #5 (Circa 1976-77): Reprints "Wanted -- the Capsule Master" from The Brave and the Bold #50, plus three Justice League of America stories. Gigant #5 (October 1978): Reprints the Manhunter from Mars serial from Adventure Comics. The Best of DC #30 (November, 1982): Reprints "The Man with 20 Lives" from Detective Comics #227. The Greatest 1950s Stories Ever Told (October 1990): Reprints "Escape to the Stars" from Detective Comics #228, plus a cover gallery. 1992 Edition. Mysteries in Space: The Best of DC Science Fiction Comics (October 1980): Reprints "The Strange Experiment of Dr. Erdel" from Detective Comics #225, plus the cover of House of Mystery #151. The Best of DC #52 (September, 1984): No reprint, but look at the back of that head! Sometime last last or early this year, I found this largely inclusive JLU greeting card at my local Krogers. Instead of the "book" format, it's a vertical card folded into three parts, perfect for a narrow blog like this one. I tried connecting the individual pieces into a whole image, but the headache that caused is the reason this took so long to post, broken up over three blogs. 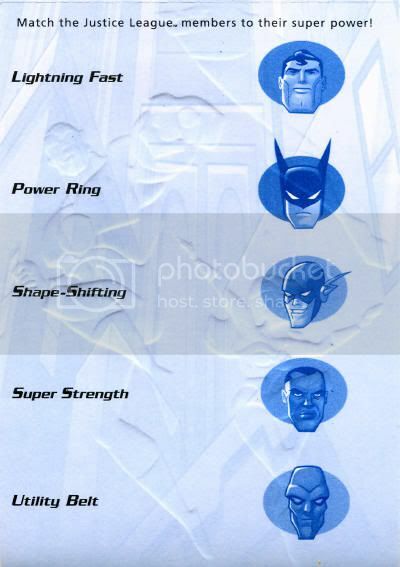 The first fold features Superman and Batman, with Kal-El's high sunken cheekbones being rather specific to his design early into the Justice League animated series. The pair look to be manipulated stock art, and the skyscrapers in the background are reproduced on the card's reverse in monochromatic pale blue. 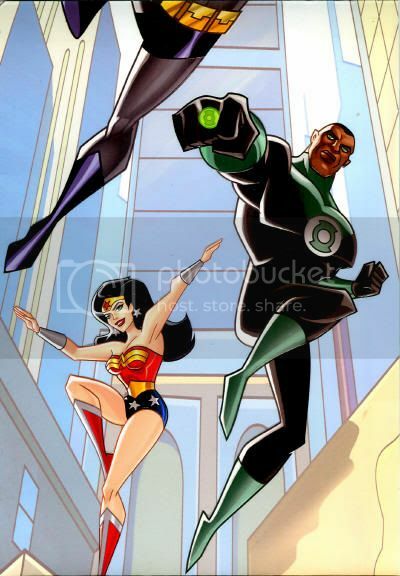 The second fold sees two of my favorites, Wonder Woman and Green Lantern John Stewart, dodging Batman's dangling lower half. After a determined Man of Steel, a scowling Dark Knight, and an Emerald Gladiator with a twisted attitudinal expression, the gentle smile of the Amazing Amazon is a relief. I should point out that all of the figures here are embossed and treated to a spot varnish against the flat printed backdrop. The reverse middle offers a challenge: "Match the Justice League members to their super power!" Superman, Batman, Flash, Green Lantern, and Martian Manhunter were in play, with the Sleuth from Outer Space being linked to "Shape-Shifting." I guess the Alien Atlas was a spoiler, since he could lay claim to as much "Super Strength" as most anyone else. The final fold stars our own Manhunter from Mars in a sweet full body shot. Thanks to the angle, J'Onn's brow is nice and blocky, and his build is solid. This counters the dandy leanings of the high collared cape to bring the butchy back. Being his usual sour self among mostly like company, I doubt the sentiments expressed on the card could be attributed to the Martian Marvel. 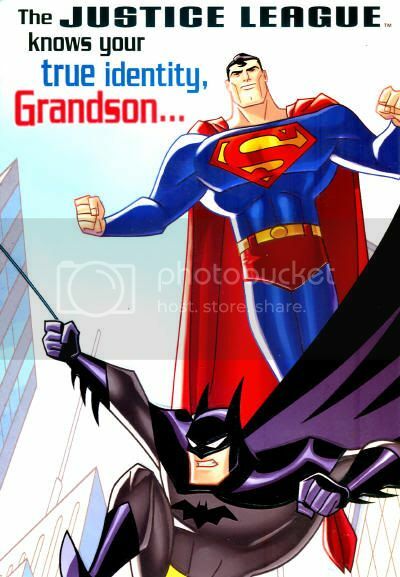 While the text residing with the World's Finest pair at the top reads, "The Justice League knows your true identity, Grandson..." the bottom continues, "...an amazing, fantastic, super-great kid!" The one character on the card given short shrift was the Flash, whose body is allowed less that one-half visibility. 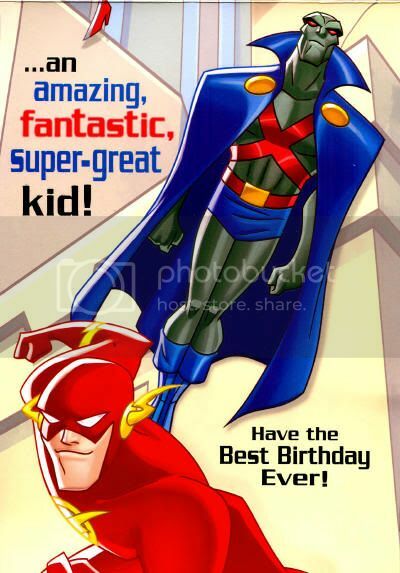 Still, grin firmly in place, he's a lot more plausible than J'Onn to offer "Have the Best Birthday Ever!" On the opposite side were the answers to the puzzle, all the copyright/branding/UPC necessities, and prices the U.S.A. (1.99) and Canada (two bits more.) If there was a decorative envelope, I couldn't find it. There are actually a number of Justice League cards in wide circulation, but most choose to drop Martian Manhunter, so his presence here was a treat for me. Finally, I'd like to apologize for my habitual lateness at this blog. I've been dealing with a lot of personal and professional upheaval related to my finally getting back to continuing my education in nursing. My grandmother worked at a hospital before her early retirement and untimely death, so this grandson congratulatory card means a bit more to me this week than most. I'm working on getting a whole buncha trains back on tracks, so please bare with. Sorry about my lousy publishing schedule this week, but Tom's got a two page biographical PDF linked above I hope you'll check out. Firing a ray gun that turns people into apes. Gottabe Grodd! Whatever happened to that "G" belt? Pimp! Still looks like Solovar is the one on a rampage, though. Too skinny and much too much cape. If not for the funky Sasquatch Grodd, this could have ranked higher. Indistinct and overly bloody, but alright. Captain Comet, Kid Flash and the Trickster may not impress, but the layout is solid. Nice tearing of the threads, but this is a bit too dated for the times. It would be nice if Grodd were actually doing something, but his presence fill the cover, so that your eye is drawn to him above all others. Grodd's placement indicates his stature as team leader, and directing three name villains plus Angle-Man rates. A very un-'90s crossover, and Grodd stands victorious, but there's a lack of oomph to carry the day. Grodd is so cut he looks like a miscolored Man-Ape, but the swipe-y image lacks the gravity of the classic John Buscema shot with Captain America and Black Panther. Unlike Action #424, you can totally tell that's the Super-Gorilla decking the Superman, and tossing in a Chuck Heston paraphrase besides. Unfortunately, it just isn't as hilariously transgressive of cape law. That is one freakish gorilla, but there's no confusing Grodd with the standard issue here. Negative space, implied menace and the 4th wall breaking conversation with simian fiend all attack your senses. This one works without trying very hard. Ever so slightly purple fur, great mass, a wicked caricatured face, and the simple fact that a gorilla would bother to zap his foe instead of pound them. There have been a number of Super-Gorilla Grodd telepathic beatdown covers, but this one works the best by far. Grodd is rolling with the Rogues and tossing Justice League robots into a garbage can. What's not to love? This image is so full of win, but the colorist screwed the pooch. It might as well have been Titano. It's tough to distinguish a Grodd cover from a general DC gorilla cover, especially when he lacks purplish hair, his monkey-mullet, a cape, tech or what have you. All Gary Frank needed was brooding evil intellect, but the chair helps. A flesh-eating Grodd roasting Batman over a spit while his friends look on in horror? My dreams aren't this good. However, the excess of flame and forced perspective hurts its Groddliness. Ignore the stupid domesticated animals. Here's a thoroughly satisfied, slavering Grodd taking a seat to watch as his greatest foe is eaten alive. What is best in life? To crush your enemies, to see them driven before you, and to hear the lamentations of their Martian.